While the banjo has been a steady presence in genres such as country, Irish, folk, Dixie, and bluegrass music for well over 100 years, the instrument has enjoyed a recent increase in popularity. Artists like Rascal Flatts, the Lumineers, Mumford and Sons, and even Taylor Swift have used the banjo’s distinctly plucky sound to add greater color and texture to their music, escalating interest even further. Today’s banjos are believed to be descended from Portuguese and African instruments with similar features. Early banjers, bonjaws, bangies, and banzas from the Caribbean came complete with tuning pegs and long, slender fingerboards, and various examples of these, the modern banjo’s precursors, date back to at least the 17th century. Modern banjos come with four, five, or six strings, along with planetary gear tuners or friction tuning pegs. They may be open-backed, although many are fitted with resonator plates on their backs. Open-back banjos are lighter in weight and have a mellower sound. Those with resonator plates are louder, and tend to be set up differently than open-back banjos, typically with lower action although this isn’t always true. We have reviewed a few different types of banjos here, omitting poorly-rated models and focusing on the best-rated low- to moderately-priced instruments. Overall, the Deering Goodtime 2 is best-rated for its widespread appeal: It is a good-quality instrument that can take you from beginner to expert over time while allowing you to experience the fun of both open-back and resonator banjo playing. With sealed, geared tuning machines including a geared fifth string, the Deering Goodtime 5-string banjo features 16 brackets and a 22-fret rock maple neck. The bridge is of maple and ebony, and the tailpiece is adjustable. With a high crown head and three-ply, 11-inch maple rim, it offers a beautiful tone. Hardwood bowtie inlays adorn the fretboard, providing a touch of contrast to the beautiful blond maple, which features a clear satin finish. The coordinator rod is easily accessible, allowing for quick, simple adjustments. Lightweight and very well made. The tone is soft and sweet, sounds exactly as a banjo should. Does not come with an armrest; however, it is possible to purchase one separately. No case or gig bag; must purchase separately. Best banjo at this price. Beautiful construction and tone. The Deering Goodtime is everything I wanted for an incredible price: You just can’t go wrong. Who will Appreciate this Banjo? While the Deering Goodtime banjo is a fantastic choice for beginners who’d like a reliable, good-quality instrument, it is also great for intermediate players as well as experts who want a nice, lightweight open-back banjo for everyday enjoyment. The lighter weight also makes this a good choice for children and people with back problems. With a single-bound maple resonator, a three-ply maple rim, and a slender rock maple neck, the Deering Goodtime 2 5-String Banjo bridges the gap between economy banjos and professional-grade instruments. Quality components including sealed geared tuners, an adjustable tailpiece, and a Deering head. Inlaid fret markers provide a pleasing touch of contrast. The resonator is easily removed for open-back banjo playing. Volume is good, but a little lower than that of a banjo with a tone ring. Guitar tuners are great but make it tough to find a case that fits perfectly. Don’t think of the Goodtime 2 as merely a beginner’s banjo but an especially “friendly” one. With 30+ years of playing dozens of banjos, I find this to be my go-to one for its clear, bright sound, cheery appearance, and light weight. I’ve taken this banjo to bluegrass festivals all over California and Nevada and everybody comments on how excellent the sound quality is. Great value for the price. The Deering Goodtime 2 banjo is enjoyed by hobbyists, professionals, and entry-level players alike. While it isn’t the cheapest banjo available, it’s also not the most expensive. If you are looking for a good-quality, American-made banjo under $1000, then this is one of the best in that category. Handcrafted in the USA, the Deering Sierra 5-String Banjo offers top-of-the-line components including a Deering ’06 bell Bronze tone ring for a strong hi and low frequency response. An adjustable tailpiece, a mahogany neck and resonator, and a beautiful ebony fingerboard add to its quality look and feel. A three-ply ring with a once piece flange and Deering planetary tuners make this professional banjo complete. Sounds incredible on its own and fantastic when you add a pickup inside the banjo. Impressive tone, look, and feel; affordable enough for such a serious banjo. A good banjo is expensive, no doubt about it, but if you are looking to upgrade, I’d recommend it any day. Simply put, it’s gorgeous, and it sounds incredible. The hardware is top notch, and playability, tone, sustain, low action, and volume blew me away! Intermediate players who are ready to take their skills to the next level are certain to appreciate the Deering Sierra 5-String banjo, and experts who need a good-quality instrument to take on stage are sure to enjoy playing it as well. While it is priced higher than many other banjos online, it is affordable when compared with other professional banjos, which can be in the five-figure range. If you’re ready to invest in an exceptional banjo, this one is well worth considering. The Jameson Guitars 5-string banjo is an affordable option despite desirable features including a closed mahogany back and a geared 5th tuner. With 24 brackets, a chrome-plated armrest and a maple bridge, it also features an adjustable hinged tailpiece. White binding and a 7-ply mahogany and maple bridge with a glossy finish give this banjo an attractive, traditional appearance. Arrived well-set up from the manufacturer; simply needed tuning. Tuning holds well and the instrument sounds great. Some frets may feel rough and require sanding. Has a smaller nut than some other models, and strings are closer together. May not be a good choice for players with large fingers. This banjo gets my warmest recommendation for those on a tight budget. A tremendous value! It looks like excellent quality, not cheap or lightweight; has a heft and feel that I would expect from a more expensive instrument. If you’re looking for a decent banjo that won’t break the bank, you’ll definitely want to give this one a look. A great choice for beginners who aren’t ready to invest hundreds in an instrument that they may or may not want to continue playing for the long-term, it’s also a good choice for more seasoned players who are looking for a combination of quality and affordability. The Jameson Guitars BANJO LH is a full-size left-handed banjo that comes complete with a geared 5th tuner, 24 brackets, and a closed back. 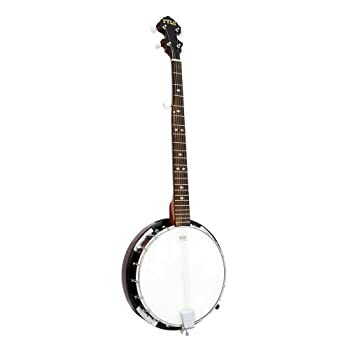 With mahogany neck, a hardwood fretboard, and a maple bridge, this banjo’s look and feel is one of overall quality. A nickel-plated armrest is included. Great value! One of the few economical left hand banjos out there. Quality instrument for learning, with a good tone and attractive appearance. If you are left-handed and want to play the banjo, then you’ll definitely want to consider this one. While it is not ideal for accomplished players, it’s very well-suited to beginners and intermediate-level players. As one of just a few inexpensive left-handed banjos on the market, it is a good choice for any lefty who wants to stick to his or her budget. With a closed back mahogany resonator and 24 brackets, the Jameson Guitars 6-String Banjo features a strong maple neck, an adjustable hinged tailpiece, and a nickel-plated armrest. Diecast enclosed tuners keep you playing strong. This 6-string banjo tunes and plays like a guitar. Well-constructed and stays in tune. Requires setup before being played. This is a musical item of its own; having lots of fun with it. Decent quality for the price. Where else can you get a banjo sound for so little dollars? Ideal for guitarists who want to add the sound of a banjo to their musical stylings, the Jameson Guitars 6-String Banjo is also a good choice for others who want to add another interesting stringed instrument to their collection. Its price is affordable, making it a good choice for anyone who wants to have fun playing without making much of an investment. The Oscar Schmidt OB5 banjo by Washburn offers surprising affordability given its quality components. With a Remo head, a removable mahogany resonator, and a cast-aluminum tone ring, it features 30 brackets, 22 frets, and a multi-inlay rosewood fretboard atop a Nato neck. A geared 5th string tuner and an armrest make for more confident, comfortable playing. A perfect beginner instrument for the banjo newcomer. Great for 3-finger picking and can stand up to use with other styles. The Oscar Schmidt OB5 Gloss Mahogany 5-String Banjo is a great choice for beginners and may also please hobbyists. Quality components assure lasting quality, and the aluminum tone ring makes for a bit less weight than many other resonator banjos. Serious, more experienced players are likely to be happier with a higher-tier banjo such as a Deering. The Pyle 5-String Geared Tunable Banjo features a mahogany back, neck, and sides, a shabili wood body, a rosewood fingerboard, and a maple wood bridge. White jade tuner pegs provide a touch of contrast, and chrome brackets. This budget-friendly banjo is fitted with a Remo drumhead. Some reviewers stated that tuning peg for 5th string was a friction peg, not geared; can be replaced by a luthier. I play this banjo with a band and most people think that it’s quite a bit more expensive than it was. I’m just learning how to play and didn’t want to spend a lot of money; I started with this banjo and am happy with it. While this Pyle banjo isn’t likely to please an accomplished banjo player, it is suitable for those who would like to learn to play while sticking to their budgets. It’s also a good choice for guitarists who would like to try their hand at the banjo. The Resolute 5-String Resonator Beginner Banjo is a full-size instrument with 24 brackets and a geared 5th tuner. The resonator back can be removed for quieter, open-back playing. This banjo features a Remo drumhead and a maple fingerboard, and comes with a useful beginner banjo guide to help you get started. Good sounding banjo for the cheap price. The strap pins wore out quickly. Neck to resonator connection seems weak. This is a decent-sounding banjo for the price, good for beginners, or for experienced players who want a banjo to take camping or traveling. Satisfactory for a beginner, and at such a price, it’s a bargain. The Resolute 5-String Resonator banjo is marketed to beginners, and is likely to disappoint expert players – that is, unless they’re looking for a cheap banjo to entertain friends around the campfire. A good starter banjo with a nice (but not perfect) sound, it is a great choice for those who want to learn to play without spending much money. The book is a nice extra. With a Remo head, a cast-aluminum tone ring, and a chrome tailpiece, the Washburn 5-string banjo features flat head construction and a removable resonator. This entry-level banjo comes with a 5-year limited warranty, inspiring confidence in its well-known manufacturer. For someone like me that is just starting out, this was a great deal. It will be years before I have to upgrade, if I ever have to! I’m very pleased with this instrument. Seems to be the best combination of value and quality I could find. While Washburn designed this banjo to appeal to entry-level players, it offers a pleasing sound, great intonation, and plenty of volume, making it a good choice for budget-minded intermediate players, as well. If you’ve spent much time banjo shopping, then you know that these instruments range widely in price, with low-end models starting at just over $100, and professional-quality banjos often coming in at prices closer to $10,000. As expert players tend to know what they’re looking for in an instrument, this banjo buying guide is aimed toward new to intermediate players. Price: It’s the first consideration for many. Luckily, it is possible to get a decent banjo for well under $500, and a truly outstanding one for $1,000 or less. If you’re not sure whether the banjo is the right instrument for you, it’s understandable that you may want to spend less: Look for something around $200, and you should be able to learn to play without frustration, while enjoying a decent sound and determining whether you’d like to step up into a better banjo at a later date. Tuners and Strings: Look for quality components, particularly if you opt to purchase a low-priced banjo or one that comes from a little-known manufacturer. Geared tuning machines are essential, as most banjos are equipped with steel strings, and as the act of banjo playing is a highly energetic one. You don’t want your banjo to slip out of tune frequently! Note that most strings need some time to “break in” and stretch. When you’re reading banjo reviews, don’t let complaints about strings going out of tune worry you, particularly when they come from inexperienced players. Additionally, keep in mind that poor-quality strings can be swapped for good ones with very little effort. Quality Construction: The banjo’s rim, or sides, should be made of wood or good-quality metal, not particle board. The reason for this is that the rim contributes to the sound of the banjo, ensuring that it offers a pleasing, distinct sound. Wood like maple, mahogany, ebony, or rosewood is desirable. Bronze or brass is heavy but provides an excellent sound, as do steel and aluminum. Of all the metals, aluminum is least resonant; it is, however, lighter in weight. Resonator or Open Back: Know whether you’d like a resonator banjo, or if you’d prefer to play an open-back banjo. The good news is that almost all resonators are removable, so you can enjoy playing either way. Adjustable controls: While these are not necessary, they are very nice to have. An adjustable tail piece helps you control sharpness, and an adjustable bridge lets you change the string clearance height and enjoy a level of action that appeals to you. Note that most banjos ship with their bridges unattached, which is something many first-time buyers are unaware of – and something that people tend to complain about when reviewing banjos bought online. The reason why so many manufacturers do this is so that the bridge does not damage the head or strings, which do the job of holding the bridge in place. You will need to position the bridge when your banjo arrives. There are many good tutorials available on YouTube, and if you’re concerned that you might attach your banjo’s bridge incorrectly, you can take it to a guitar shop for setup. The process is quick and inexpensive. Just like other items, it’s possible to find good used banjos, however there are some pitfalls to be aware of. Unless you are an experienced banjo player and you have the ability to get the seller to play the instrument for you (via Skype or a similar service if you’re considering buying online), it’s best to steer clear of the secondhand market. Banjos found in pawn shops and at other secondhand venues are often damaged, sometimes to the point of being unplayable. Cheap banjos often end up in such places, brought there out of buyers’ remorse when it’s too late for the seller to accept a return. If you do opt for a secondhand banjo, be sure to purchase it from a reputable dealer such as a music shop. Handle the instrument and play it yourself, or have someone play it for you before you commit to making a purchase. In the end, it’s best to buy a banjo that appeals to your needs as well as your budget. Buying a sub-par banjo usually leads to frustration, while a good one will provide you with many years of enjoyment. We wish you all the best in your banjo playing adventures to come!